When you think of this delicious little fruit, chances are you think of festive times. It is generally eaten dried, or made into a tangy sauce that’s a Thanksgiving mainstay. But today you’ll find out that this little berry can help build your bones, so you’ll want to eat it more often than just during the holidays. 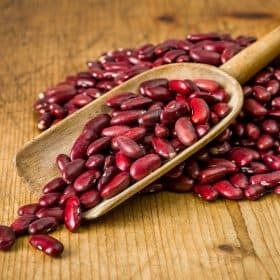 Although the tart and flavorful cranberry is acidifying, it’s a Foundation Food because of its excellent Vitamin C content and other bone-healthy nutrients. The health benefits of cranberries cover a range of body systems, all of which tie into your bone health. Rich in Vitamin C and antioxidants, these berries have a fascinating history and many modern applications in the realm of osteoporosis treatment. This is why they are actually one of the Foundation Foods in the Osteoporosis Reversal Program. But I Thought You Said Cranberries Are Acidifying…? Yes, cranberries are acid-forming. But as many of you already know, the Osteoporosis Reversal Program is not about avoiding all acid-forming foods. Rather, it’s about balance, and avoiding eating a diet that’s too acidic. If you eat cranberries for their health benefits, simply count them as part of your 20% of acidifying foods for that meal. Cranberries have too many health benefits to cut them out of your diet entirely! In fact, cranberries’ reputation as a treatment for urinary tract infections (UTIs) was once attributed to its high acid content. But in actuality, cranberries contain substances called proanthocyanidins, or PACs that are largely responsible for cranberries’ action against UTIs. PACs are found in other berries, but in cranberries, they have a special structure that prevents bacteria from “latching on” to the lining of the urinary tract. Because of this unique anti-bacterial action, researchers are considering the use of cranberries to prevent bacterial ulcers of the stomach. Here’s a fun fact about cranberries: they are sometimes called “bounceberries” because they are so bouncy when ripe. (If you share this fact with your family, it will be hard to keep young kids from testing this theory!) This bouncy trait is a convenient way to remember that cranberries contribute to bone flexibility and tensile strength. It makes sense that we associate cranberries with Thanksgiving here in America – cranberries are one of only 3 fruits that are native to the US and Canada (the other two being concord grapes and blueberries…more on blueberries later). Native Americans used these berries for food, healing, and making cloth dyes, and the Pilgrims soon learned how to use these versatile fruits. Settlers took it a step further and started making cranberry juice around 1683. Cranberries grow on evergreen shrubs in acidic peat bogs, not in water as is sometimes believed. They do require lots of fresh water, and their growing season stretches from April to November. For fruiting buds to mature, the vine-like cranberry bush needs a long, cold winter. This is why they are found in northern climates; but in more southerly locations, cranberries still grow wild in higher elevations where there are bogs. Vitamin C is a Foundation Supplement that acts both as a vitamin and an antioxidant, and it is vital in the production of the protein collagen. Without Vitamin C, collagen simply isn’t formed correctly and can’t do its job. And it has a very important job: collagen is manufactured and secreted by osteoblasts, the bone-building cells, and from there is binds the bone matrix cells together. For all of this to occur, the collagen must be “hydroxylated,” a process that cannot occur without the presence of Vitamin C.
Vitamin C also helps the immune system, a well-documented and thoroughly researched attribute of this amazing vitamin. And a healthy immune system is crucial for bone health, primarily because it is so central to the regulation of your body’s inflammatory response. A healthy immune system keeps excessive inflammation under control, which is important for your bones because inflammation has been shown to accelerate bone loss. Polyphenols are an inflammation-fighting, antioxidant plant pigment that you’re familiar with if you’re following the Osteoporosis Reversal Program. Cranberries are related to blueberries, and like blueberries, they are rich in polyphenols. Polyphenols are a class of antioxidants that are responsible for cranberries’ red color (and blueberries’ blue color, and the pigments in a host of other colorful fruits and vegetables). These plant pigments, which occur in high amounts in cranberries, actually increase the production of osteoblasts. The polyphenols in cranberries also decrease inflammation, especially in the digestive tract and gums. Excessive inflammation is harmful to all body systems, including your bones. Cranberries stop inflammation before it has a chance to go too far, as the polyphenols stop cytokine production. Cytokines act as messengers, telling the body to continue the inflammatory response. Cranberries knock out the messengers, so the message to keep up the inflammation doesn’t get delivered! A half a cup of cranberries contains .18mg of manganese. The Recommended Daily Allowance for manganese is 1.8mg for women and 2.3mg for men. 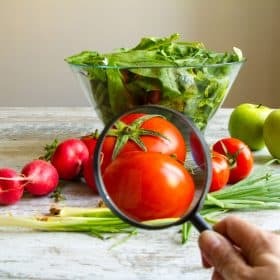 Manganese is included as a Foundation Supplement in the Osteoporosis Reversal Program because it plays such an important role in, among other things, the synthesis of connective tissue in both cartilage and bone. Manganese is also an activator of superoxide dismutase, a key antioxidant. To get the most out of cranberries, first, avoid buying dried cranberries because of the high sugar content. Second, avoid canned cranberries because of BPA in the inner lining of the can. So go for fresh or frozen berries. Store in the refrigerator for no more than 20 days. Pick out soft, shriveled, or discolored berries before refrigeration. Rinse berries carefully in a colander before putting them in the refrigerator. Frozen cranberries can be kept for several years. Freeze your own by spreading them on a cookie sheet and placing the sheet in the freezer, then remove the berries to a freezer bag. Use thawed berries right away (they will be very soft – the bounce will be lost, but the berries are still fine to eat). To get the maximum benefit from cranberries’ high nutrient content, it’s best to eat them fresh and uncooked. Raw cranberries can be tossed into salads to replace vinegar. Try raw cranberry sauce by blending cranberries in a blender with pineapple chunks, a sweet apple, and a whole, peeled orange. Bake fresh cranberries into breads and muffins. If you are taking the blood thinner warfarin (Coumadin), please note that cranberries inhibit an enzyme necessary to break down and process warfarin, and they also naturally contain salicylic acid. This can increase the chance of dangerous bleeding already present when taking warfarin. So if you’re taking warfarin, consult with your health practitioner. There’s even more you can do with this amazing little fruit. You can also use it in home-made cosmetics! Here is a recipe for a natural, edible, tinted cranberry lip gloss that is great for wintertime. Of course, you can use it year-round. This recipe makes half an ounce of lip gloss. Place all the ingredients in a small saucepan. Heat just to the boiling point. Remove from heat, stir, and gently mash the berries. Cover and allow to sit for 5 minutes. Strain and cool. Pour the cooled lip gloss into a small container and spread on your lips as needed. I live in India, and unfortunately cranberries are not grown here, nor many aother types of berries. Can readers from India (or anyone else for that matter) cast any light on home-grown (grown in India) substitutes for the goodness of cranberries, or for berries in general? The only India-grown berry I am aware of is the strawberry (seasonal and horribly pricey), and the goose-berry, known locally as the ras(juicy)berry, again seasonal in the north (doesn’t trickle down south where I live). So, any suggestions? u can get the dried ones at healthy u stores but u cannot find the fresh once here.am in Nairobi Kenya as well. Do you have answers on how to grow severe hair loss? How can get the fresh cranberries in the Philippines? For a diabetic like me, how many cranberries in grams can i eat daily? WOW! That Was A Very Interesting Article. I Never Knew That Cranberries Did All Those Things, Except I Knew They Were Suppose To Be Good For Urinary Tract Infections. But That Was About It! Thank You VERY MUCH For Sharing This VERY INTERESTING ARTICLE With Us. Take Care And Stay Well. Thank you Vivian for your book and all of your additional information. I have recently been told that I have osteopenia in my spine and osteoporosis in my hip. I read your book and have done very well with the diet and staying alkaline. I did end up in the emergency room a couple of weeks ago with a very painful kidney stone. Should I cut back on the calcium or do any thing different to prevent kidney stones in the future? I hope you have a good weekend! I cant get ripe fresh cranberries. What if I have dried cranberries. I am a little confused. I have been on your program for quite awhile. The book I purchased from you is called “The Bone Health Revolution.” I see that the book on your website now is called “Osteoporosis Reversal Program.” Are they one and the same or different versions? If you have any other questions, feel free to drop us a line at Customer Service – just click on the smiley face at the top of the page. Thanks! I use to come down with urinary tract infections for years. Then, one of my Dr.s told me to take Vitamin C everyday and that would stop it from happening. I haven’t had an infection for well over 15 years now. It’s a lot cheaper too then ingesting cranberry juice or cranberries. First of all I would like to thank you again for the interesting articles you send. Have you heard about the Chios gum mastic? Does the rasin have any effect on the bones? It is manufactured in Greece. I am having a hard time keeping my acid levels above 6.2 I am eating nearly 100 % no acid forming foods. I have had this issue for 6 months and cannot seem to get it right unless I gorge on watermelon. I am going through a hard time with sick parents. My father died 2 weeks ago and my mother has been taken off 2 years of chemo and put on hospice. Is this sad time( I cry a lot at the drop of a hat!) causing my acid? I need to stop this acid since I have a -2.8 score and am trying to repair myself. I am afraid to eat a cranberry! Linda: If your mother has been put in a hospice for terminal cancer, you still have the chance to cure her with a very effective alternative treatment.You may email me to get all the details. what do u mean she can still cure her when it is already terminal? Linda, I am so sorry you are going through such a difficult time. Did you know that stress can affect your pH levels? So can a host of other factors! So here’s my suggestion for you: don’t worry about your pH right now; rather, eat well, enjoy the time with your family, and allow yourself to grieve. Thanks! I’m a big cranberry fan; my state is the top producer of cranberries. I’ve been drinking cran juice for bkfst for some time now. While I’ve chronically been subject to UTIs since my first pregnancy, I have now not had a UTI in well over a year, though I used to get them every few months. Gradins of People’s Pharmacy recommend 10 oz daily of juice that’s a minimum of 25% cranberry as a maintenance dose to discourage UTIs. Works for me! 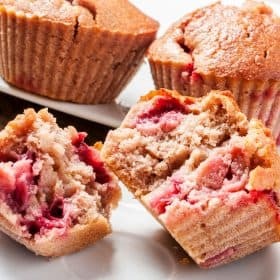 I love to use fresh cranberries in muffins and breads. I find I can also add them to Rhodes Frozen bread along with walnuts, if I thaw the loaves sufficiently before rising in the pan. Delicious toast – AND bone friendly! Are pomegranate a healthy food? I like to put them in my tossed salad. I cnnot each the raw cranberries because they are too tart. Any suggestions. I have just read your article on cranberries, did you know that a lot of cranberries are grown in water that has had a lot of chemicals in it. We were in British Columbia, Canada a few years back and was driving by a cranberry farm, there were fields of cranberries growing, but there was also very large signs telling us not to go near the fields because of the chemicals that were in the water!! We have been very careful about where and how cranberries were grown before we buy them. Wow, Sharon – thanks for the heads-up! It’s too bad how chemicals are so widespread. We eat them once/week. Cook with maple syrup, grade B. Delicious! Although they are pretty tart, will have to try in salads as you suggested. So MUCH in something so little. Every year at Thanksgiving & Christmas time I make Cranberry orange bread. My familly loves them so I have to make 2 loaves at a time. This past season I started to use Slimtevia to replace most of the sugar. It worked great and much healthier. The recipe I have says to chop the berries but we love the tartness when leaving them whole. Frest cran, are good added to apple pie. Thanks Vivian for all your good research.